Renaissance Dad: WTF - Where's the Fruit!?! WTF - Where's the Fruit!?! When I was a kid and we went to the mall food court, there was one shop that always got my business. It was a fruit stand, and they had a fresh fruit cup. And on my 8th birthday, instead of a birthday cake, I wanted a watermelon. So my parents cut a watermelon in half lengthwise, put some candles in it, and I was in hog heaven. Needless to say, I love fresh fruit. Living in Arizona, I am amazed at the number of citrus trees in peoples' yards. I was even more amazed when I learned that many people throw away their excess fruit at the end of the season. What a travesty! So this has created a boldness in me to ask my neighbors to let me glean. Freecycle.com and Craigslist.com are additional resources to find people in your area that have excess fruit (I wish I had done this in Illinois, looking for people with excess apples!). So I asked my neighbors if they ever have extra citrus, and they invited my kids and I to come over and pick whatever we wanted. We ended up with a large bag of oranges and a large bag of grapefruits. We decided to juice them. Instead of peeling the oranges, I cut the top and bottom off, and then follow the curvature of the citrus with a knife, cutting the pith (the white part) off with the peel. I lose a little of the fruit, but I more than make up for it in the time that I save, especially when peeling a large quantity of citrus. The judge's decision - two thumbs up! Then we dropped them into our trusty Jack Lalanne Power Juicer and, voila, two gallons of fresh juice. Five years ago, my wife and I had the most life-changing fresh- squeezed orange juice at Bar Cappuccino di Luigi in Rome. If you are ever in Rome, go to Bar Cappuccino di Luigi and order the blood orange juice. In the meantime, I will now teach you the secret of Luigi's liquid nirvana. A little fresh squeezed lemon juice in your orange juice pops the flavor. Yeah, it literally and metaphorically pops the flavor. For our gallon of orange juice, I added one lemon. Boom. I blew your mind. You're welcome. One last observation. Fruit is not just for taking. At our first house, we planted a peach tree, which ended up being the only peach tree on the street. Every year, we packed up bags of fresh peaches and delivered them to our neighbors. It was a great way to connect with our neighbors, share with them, and enjoy our harvest all the more. May the fruit be with you! What's Arugula? It's a Ve-Ge-Ta-Ble! 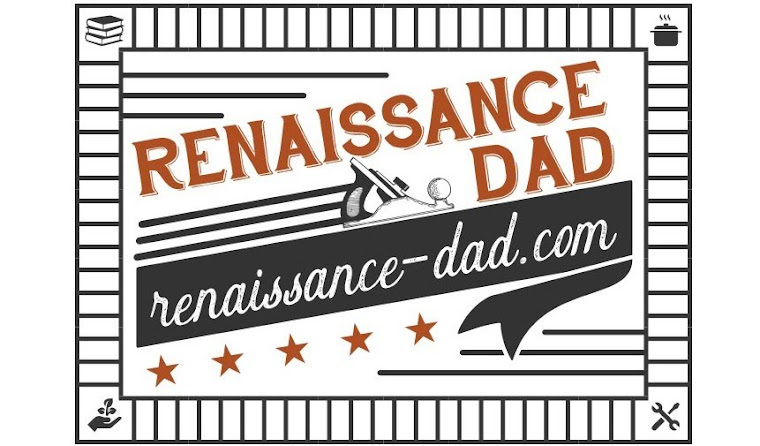 What is a Renaissance Dad?